After a long hot Arizona summer the Winter Range Rough Riders are gathering together to ramp up work on Winter Range 2011 as this will be no ordinary Winter Range! 2011 marks the 20th Anniversary of Winter Range and we are committed to making it special. For starters, every Action Match Shooter will be entered in a drawing for a pair of Ruger SASS Vaqueros! And fitting for an anniversary; this year Winter Range is proud to host the first SASS National Wild Bunch Championship. The Wild Bunch match will be a two day, 12 Stage match on Tuesday and Wednesday (22-23 February). And if that is not enough, the Tombstone Ghost Riders will be hosting the SASS Western National Championship of Mounted Shooting on Saturday and Sunday (26-27 February). All of this in addition to the Wednesday Side Matches including a 4 stage Warm-up Match, a 4 stage Plainsman Match, Long Range Events, Shotgun Events, and Speed Events. 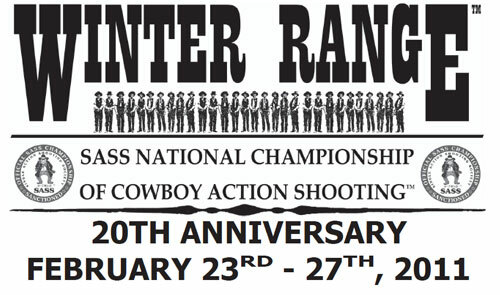 So if you have not already signed up for Winter Range 2011 you can do so now and attend the SASS National Championship of Cowboy Action Shooting, the SASS National Wild Bunch Championship and the SASS Western National Championship of Mounted Shooting. A coupon and applications are available at www.winterrange.com , or you can call us at 623-465-8683 and we will send or email you a coupon and application. The coupons expire on December 15th, so do not delay too long! If you have already signed up for Winter Range 2011 we thank you for your support. As a two-time winner of the SASS Wooly Award we make every effort to make Winter Ranger the best it can be. We think you will be pleased with what we have planned for our 20th Anniversary. Next articleSASS Reaches 90,000 Members!